Editor's note: This is the fourth post in our “Mapping a Better World” series, highlighting organizations using location data to affect positive local and global change. Today’s guest blogger is Alessandra Mosenifar, Senior Product Designer for charity: water. Read how the organization uses Google Maps to share the results of their work providing clean water for millions of people. Charity: water’s mission is to bring clean drinking water to everyone on the planet. We work towards this mission by funding global partners who understand what’s needed for their specific communities. Our partners around the world have years of experience working with their state and local governments to build sustainable, community-owned water projects. We ensure this information is transparent and accessible so that donors, stakeholders and interested users can see what has been funded and the realized impact. 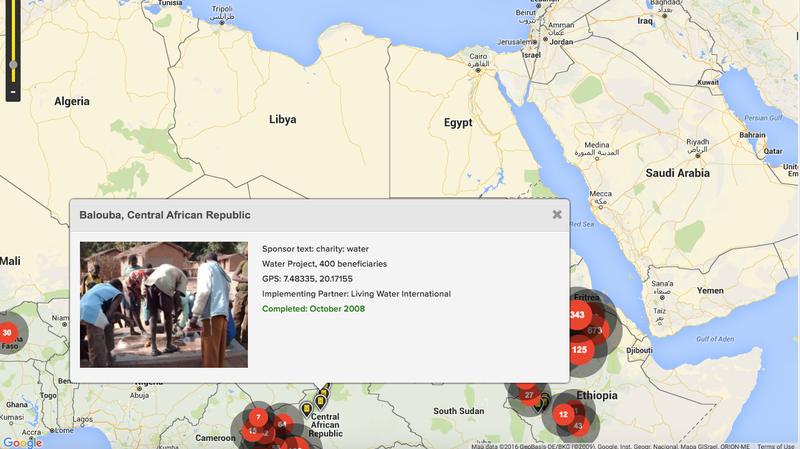 With Google Maps APIs, we were able to create a new way for donors to view exactly where their dollars go. We also built an easily digestible map packed with details and visuals for the thousands of water projects we've completed. Each project is represented by an icon on the map. When a user clicks the icon the project details appear — including the project completion date, the number of people benefiting from clean water, the implementation partner and the project's precise GPS coordinates. We also recently partnered with Google on a program that allows us to continuously monitor water projects and provide reporting accessible via our website. Using sensors to measure water flow per hour (transmitted weekly), we know if a water point is broken, as well as learn patterns of usage on a daily or yearly basis. Anyone can take a look at project status and details, including the average number of liters of water provided each day. To date, we’ve funded nearly 20,000 water projects in 24 countries, providing clean water to more than 6 million people. Thanks to Google Maps APIs, donors can see exactly where and how their money is spent. Beyond providing clean water for millions of people, we’re helping transform how charities work by providing the highest degree of transparency about donation impact. If you're a nonprofit and interested in staying up to date on grants offerings for Google products like Google Maps APIs, apply to join Google for Nonprofits today.